The Manchester Pub has been the premiere destination in town for football (or soccer) fans in Windsor-Essex for over four years now. Their name, at first attracted fans of Manchester United, whose passion for the sport and their team lead to an influx of other English Premier League and other European league fans to begin watching – and cheering – their own teams. Over time, this excitement has led the Pub in becoming the destination for World Cup action in 2010, creating an atmosphere of fan excitement unseen by even the most loyal of North American sports fans. In 2011, The Manchester Pub become the officially sanctioned headquarters of the Manchester United Supporters Club of Canada’s Windsor-Essex chapter, regularly opening early for every and all United fixtures, live with sound. The response was incredible, with fans from the county to the city showing up in their jerseys, with their scarves and with their United songbook in tow. Champions League and Euro Cup only strengthened the Pub’s stature and reputation as being the best place to watch European football. 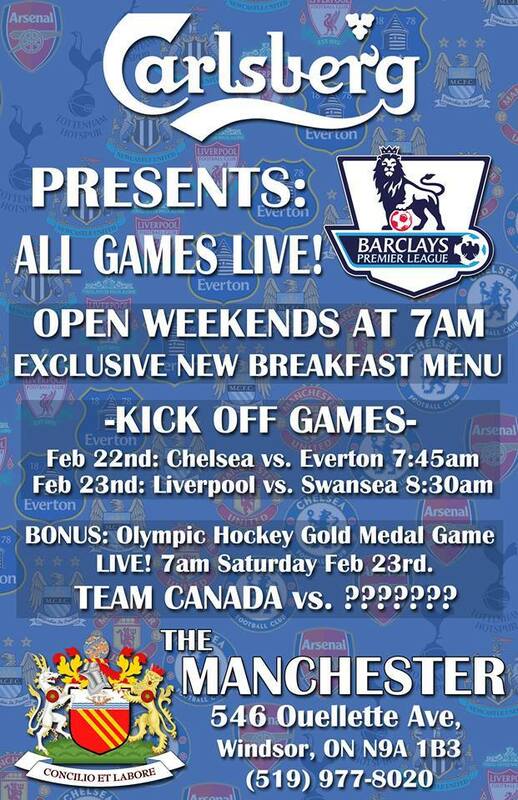 With World Cup 2014 fast approaching, as well as an emerging new appreciation in North America for English Premier League football, The Manchester Pub will be launching Premier League Breakfasts the weekend of February 22nd. This means that beginning that particular weekend, the Pub will be open at 7am every Saturday and Sunday, catering to not only the faithful United Supporters Club, but to fans of every Premier League squad. The Pub will be televising all available EPL games, including the early morning matches, all while serving an exclusive breakfast menu from 7am to 11am. The day will also be sponsored by Carlsberg, who will be providing EPL swag for giveaways through the morning, including one official Premier League team jersey given away once a month, culminating in a Fusbol Table giveaway, to be drawn the final weekend of the 2013/2014 Premier League season. The opening weekend kick-off matches are Chelsea vs. Everton at 7:45am on Saturday February 22nd and Liverpool vs. Swansea at 8:30am on Sunday February 23rd. Sunday will have an added bonus of live coverage of the Winter Olympics Men’s Hockey Gold Medal game, live at 7am. Obviously it will feature Canada versus an as yet to be determined opponent! The Manchester Pub is located on Ouellete Avenue in Downtown Windsor.